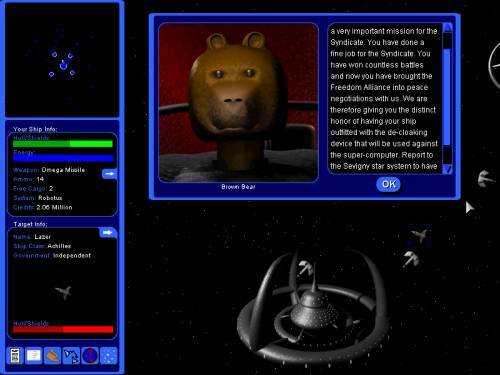 Explore the galaxy in search of fame and fortune in this exciting new space adventure game. Become a trader, bounty hunter, rebel, stock market guru, or even a deadly space pirate. Buy from a large selection of ships including freighters, fighters, and capital destroyers. After you have acquired a fast ship you can upgrade it with powerful weapons and modifications. Will you be savior or scourge of the galaxy? It's your choice. There are many paths to choose from in Jack of All Trades. As a trader you will fly between exotic destinations throughout the galaxy. As a bounty hunter you will hunt down the scum of the universe. Once you have earned enough cash you will likely want to set your sights on something grander: saving the galaxy itself. The various governments and guilds are at war with one another. Something needs to be done. Are you up to it Captain?